Randy Ramusack, the United Nations Technology Officer for Microsoft Corporation (Research4Life), came to this ALA session to talk about Microsoft and “Creative Capitalism.” The undisputed star of the show, however, was Matt Keller, who is the Director of Europe, Middle East & Africa, One Laptop Per Child program. 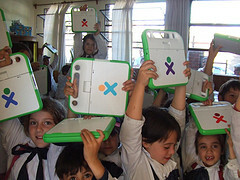 Although you might recognize OLPC for their cute little XO laptops that began the Netbook craze, Keller stressed that OLPC is an education program instead of a technology program. Based in the U.S., OLPC is a non-profit organization that sets up and supports laptop-distribution programs in developing countries. The programs are then run by independent organizations (such as NGOs) in their home countries. This is absolutely fantastic! It really rubs me the wrong way when philanthropic organizations take a “compassionate colonialist” attitude to other countries by imposing their foreign values onto cultures they don’t fully understand. OLPC avoids this by empowering nations to run the programs on their own. OLPC provides the technology and the framework of 5 Principles: Child Ownership, Low Ages, Saturation, Connection, and Free & Open Source. Everything else is up to the home country. Uruguay, for example, set their own goal that all users will be within 300 feet of a wireless network. Keller pointed out that when kids have laptops, these things are also in demand: Access to government documents, digitization as a service, usability, tech support / programming, & reference help. Besides being adorable, XOs are amazing little machines in many other ways. Designed by MIT professor and OLPC founder Nicholas Negroponte, they are designed to use minimal power so that even low-power communities are able to use them. When one XO catches a wireless signal, it can extend that network to other nearby XOs. They also have an extremely durable exterior that you can play rough with, making them perfect for kids. I LOVE this aspect of the XO – in the OLPC photostream on Flickr you can see that kids have really been able to integrate these machines into their active lives, rather than staring blankly into a big strange box sitting on the desk in front of them. An audience member asked whether OLPC has conducted any assessments to see how laptops are affecting communities in the developing world. Keller answered that they encourage assessments, but that they do not conduct assessments on their own because it would be impossible to avoid their own self-interests. Most of the programs are happening outside of the U.S., although Birmingham, AL and Chester, SC are among the few U.S. sites that have started OLPC programs.